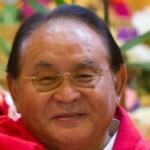 Don’t forget to keep checking SogyalRinpoche.org for a growing selection of teachings from the author of the international bestseller The Tibetan Book of Living and Dying! Training in meditation is like learning how to ride a bicycle. Once you know how to keep your balance on a bike, you don’t have to think about your balance any more, because the balance is in you. Likewise, once you have trained in meditation, your mind is in balance. There is a way to find that balance and go beyond thoughts into the nature of mind. Thoughts are like clouds. Even though the clouds sometimes seem to cover the entire sky, if you take a plane you can go beyond them into a vast space that is never even touched by the clouds. The clouds of our ordinary thoughts are just temporary and changing, whilst the deeper nature of our mind is unchanging, like the infinite space of the sky. This teaching is from Vigo, Spain, 17 October 2012.